When I first saw this idea I was pretty skeptical but I figured if it works for Rachael Ray, I should give it a shot. I can honestly say I will probably never make a “normal” grilled cheese again. This was beyond amazing. A grilled cheese that tastes like stuffed garlic cheese bread! Mix mayo with a few dashes of garlic powder, parmesan cheese and Italian seasoning. Heat pan on stove top to medium. 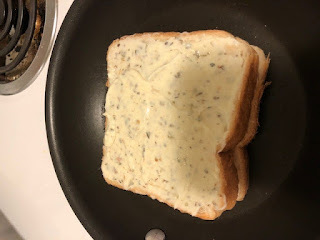 Spread mayo mixture on one side of each piece of bread. Put bread mayo mixture face down, layer on cheese. 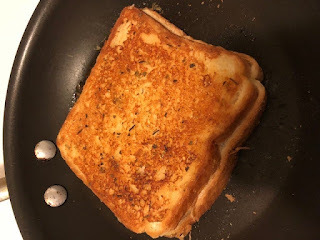 I used American, mozzarella and pepper jack. Place other slide of bread on top. Cook until golden brown on both sides. Wanna step it up a notch? Throw in a few pieces of pepperoni, bacon bits or jalapenos. This is a total game changer.